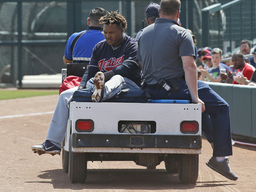 GLENDALE, Ariz. (AP) Cleveland Indians third baseman Jose Ramirez bruised his left knee when he fouled a ball off himself Sunday and his status for opening day is uncertain. X-rays on the two-time All-Star were negative. The team said Ramirez will remain in Arizona, and that it will be determined later whether he can play Thursday when the AL Central champions open at Minnesota. The Indians already had a depleted infield when Ramirez was carted from the field after getting hurt against the Chicago White Sox in Cleveland's final exhibition of the year in Arizona. He wasn't able to put any pressure on his leg as manager Terry Francona and a trainer helped him onto the cart. The 26-year-old Ramirez hit 39 home runs with 105 RBIs while batting .270 and stealing 34 bases last season. He has finished third in the AL MVP voting in each of the last two seasons. "He has a done a lot of damage against right-handed pitching," Francona said, before the Ramirez injury. "We will mix and match a bit depending how guys are swinging the bat. Our guys did a good job of finding someone who could help us at this late stage of spring. That's not an easy thing to do."